The system dedicated to business + , for use at hair and beauty parlours, cafés, etc. It ensures an additional source of income. 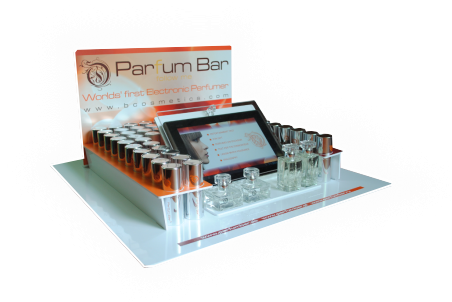 The System Parfum Bar MINI makes an ideal solution for customers waiting for their appointment. The customer is given a tablet and asked to answer 7 questions concerning everyday life. Based on the answers, the system generates characteristics of their personality type and selects a suitable fragrance palette. Instead of browsing through outdated waiting room magazines, your customer may discover what fragrance notes match their personality and, buying the perfume,will provide additional source of income for the salon. Exposing all the fragrances - "easy to find and sell"
Efficient use of the salon space. A great functionality and a modern look. 1. A tablet equipped with software. 2. Easy to find. 3. Product display. 4. Lightening. 5. Stand	6. Back side 7. Storage space for blotters. Buy perfumes with us, and you will receive: System PerfumBar® MINI, a tablet, testers, bags, and perfume samples - worth 1.500 PLN, for not more that 50 PLN*. For details, ask our consultant. We will supply you with all the necessary materials to help you focus on your business - your investment will pay off sooner than you might expect. You cannot miss this offer! * The prices quoted do not contain VAT.